Android is a smasher from Gothensburg, Sweden who mains red Sheik. He is Aniolas and Armada's younger brother. He regularly teams with Armada when they travel to America and their greatest accomplishments were winning The Big House 5 and GENESIS 4 in the teams events. 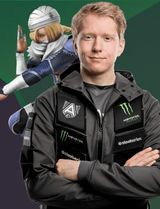 He is currently ranked 3rd on the Swedish Melee Power Rankings, 8th on the European Melee Power Rankings, and 66th on the 2018 MPGR. This page was last edited on February 5, 2019, at 04:28.